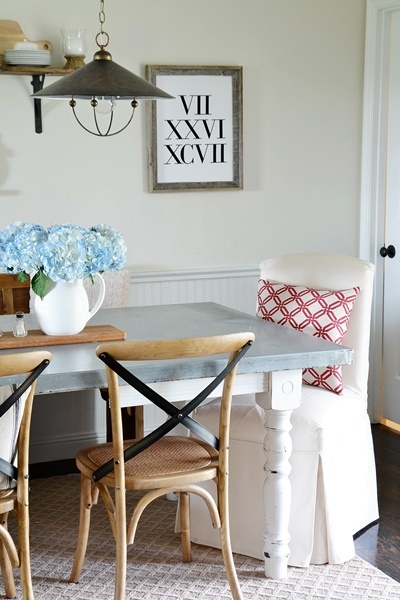 I am sooooo excited to show you my new dining space!! I’ve never really liked our eating area. 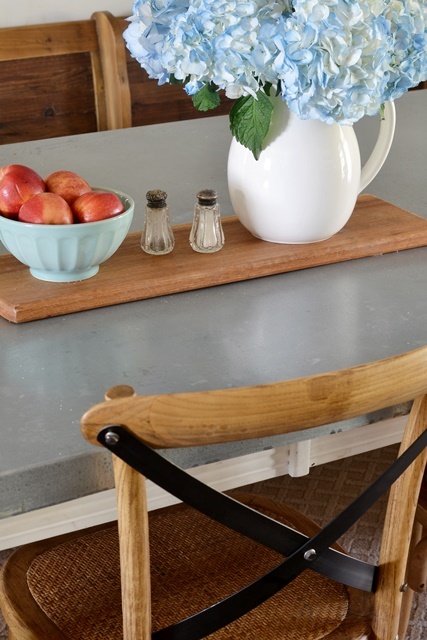 I love the galvanized steel top table that we made for our kitchen, but other than that, this space needed a lot of help. I mean, A. LOT. 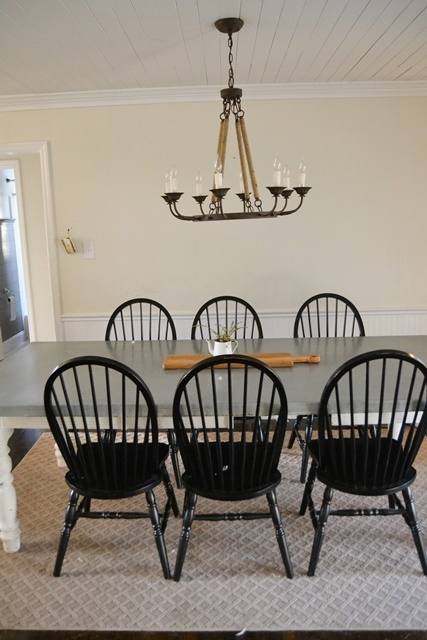 The black windsor chairs were not going with the look I wanted to create for our kitchen. I wanted a more warm feeling. And now I’ve got it!!! Here is my new dining space!!!!! It is definitely much more warm and inviting! The main change in this space was the seating. There is now enough space for 8-9 people to sit around the table. I flanked the table with these beautiful Alaina slipcovered chairs. Most people think I am crazy for having white furniture in my house with four boys, but they are my absolutely favorite thing to have! All you have to do is throw the slipcover in the wash, and it looks like new! Against the wall, I placed this charming Kensington Bench. The boys LOVE this bench and fight over who gets to sit there! 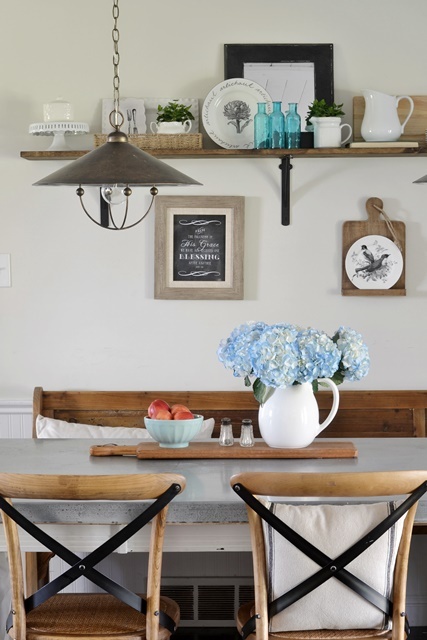 The bench adds a lot of character and warmth to our kitchen. And it will be fun to decorate with different pillows throughout the seasons. It reminds me of a church pew. For the other side of the table, I chose three Cadence chairs. I got mine in oak, but they also come in black and cream. The metal detail on the back is beautiful!! I feel that all 6 of these furniture pieces really go well together even though they are all so different. To finish off my dining space, I added two Darcy pendants. I am crazy about these pendants! They definitely add a farmhouse feel to my kitchen. I started with just one pendant light over the table, but since my table is extra long, I needed two pendants. 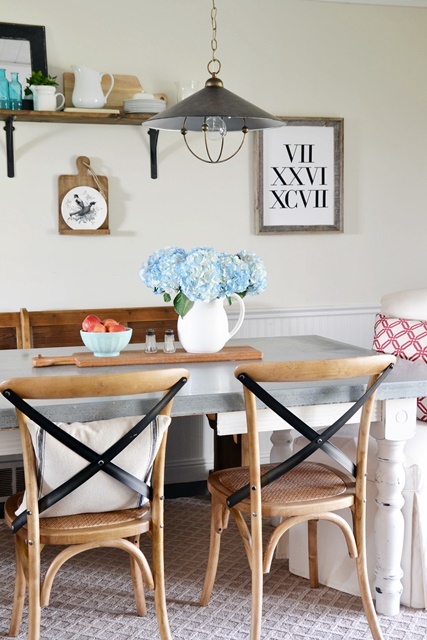 All of the pieces that I used to freshen up my dining area can be found at Arhaus. Hope you have a blessed day!! *This post was sponsored by Arhaus. 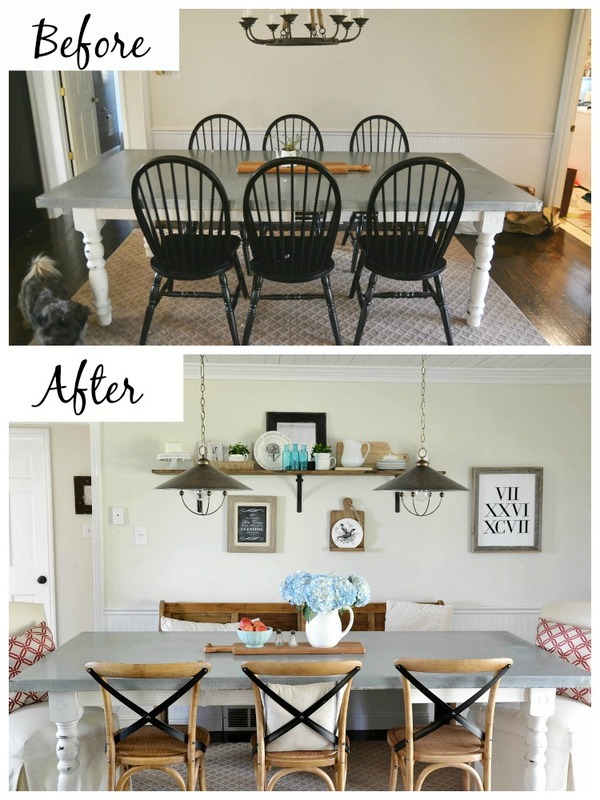 I was able to pick furniture pieces to create my dining area makeover. I chose pieces that best suited my decor. All opinions and ideas are 100% mine. What a transformation! That bench is to die for. Love the new warm wood tones you brought in. And the straps on the back are so unique! I love it! It is elegant without being stuffy! Beautiful pew bench! 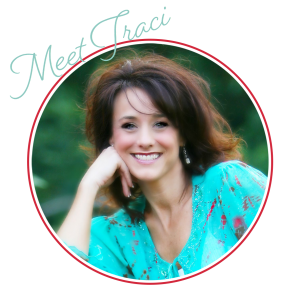 Some AMAZING changes, Traci! You will love that space during the holidays! This looks fabulous. Love it. so happy for you. Happy Thanks and Giving! TRACI! I am so happy for you!! Your eating area looks absolutely stunning. You did a great job mixing and matching the various options to create a space that looks pulled together but very much collected over time. Gorgeous! Did you know that I have a deacon’s bench from my grandmother’s church at my dining room table? It’s not as practical as your bench, but I love having it! I also have a tiny antique pew in my foyer. 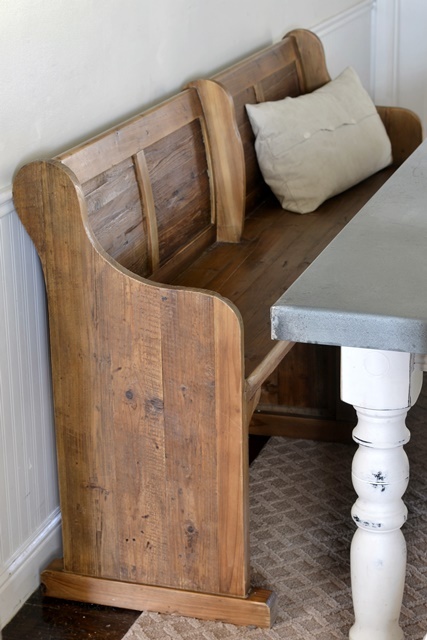 I love that yours has the look of an old pew but it’s actually a practical, solid new piece. Now I’m really curious: were you and Cy married on July 26, 1997?? I love the bench and the new chairs. Fabulous. Such an inviting space. That space looks amazing now! 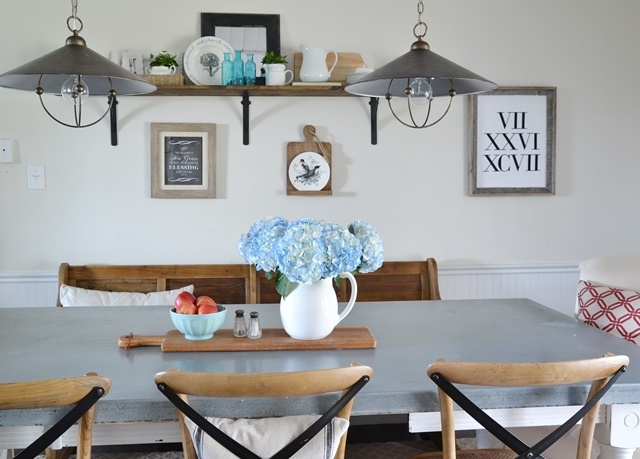 I love the mix of seating and the new light fixture. Love the wall design too. 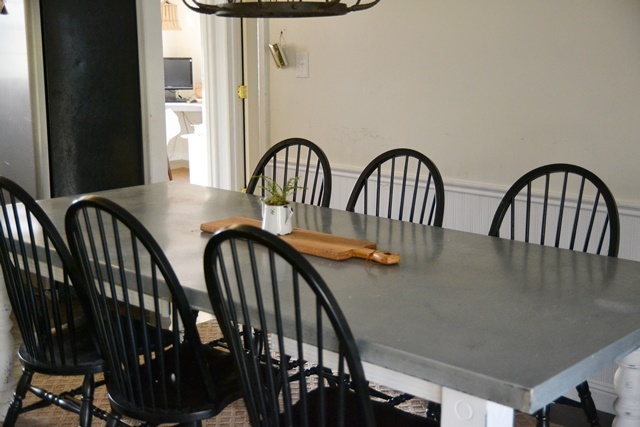 Could I ask you about the galvanized steel top table? I am in the process of finding a new kitchen table and think that looks great! I love your eating area! You did a great job of putting it all together. It is unique and homey and beautiful! Thanks for showing us! It is absolutely charming! Beautiful!! 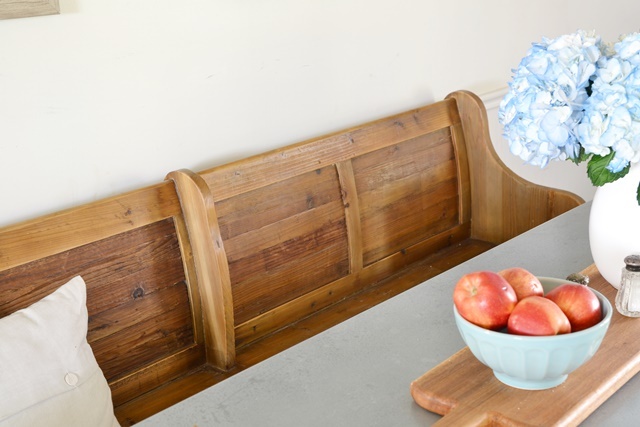 I especially love your cozy beautiful bench — what sweet memories you will have of your boys gathered there –it is even more special that it looks like a pew — the sacred in the everyday moments. I am! 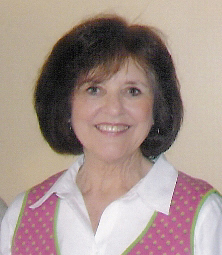 Thank you, Elizabeth! You pulled that together beautifully! Big improvement and so inviting! I love it Traci! 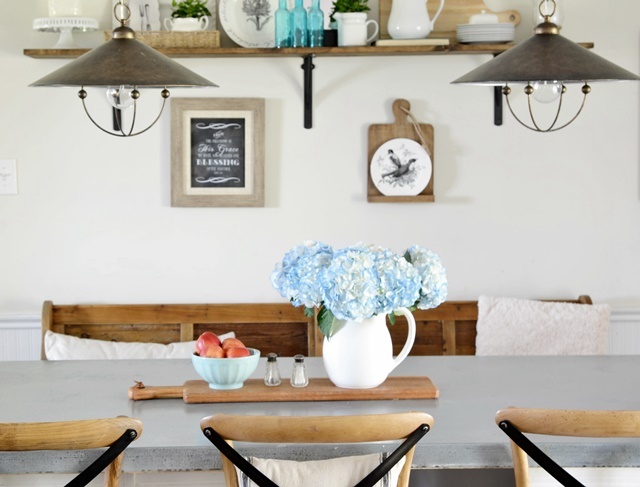 The combination of seating is so cozy & perfect for the table where everyone gathers. I DO love it! Great job. Fabulous room! I love Arhaus, based here in Ohio! Beautiful! You MADE that table? 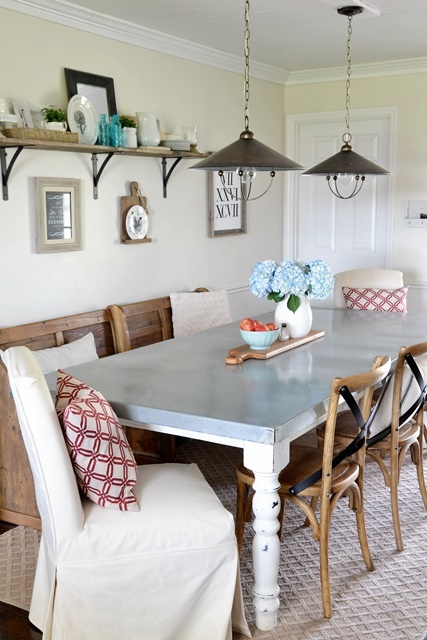 I have wanted a galvanized table like that. Details? 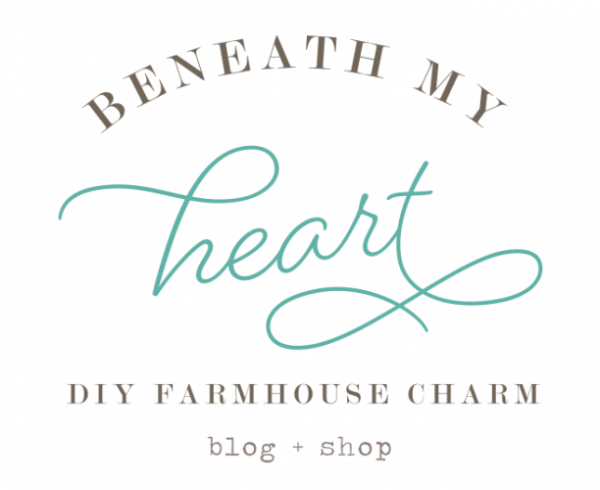 Just click on my project gallery tab and click on diy projects. You will be able to find the link there. Hello Traci! 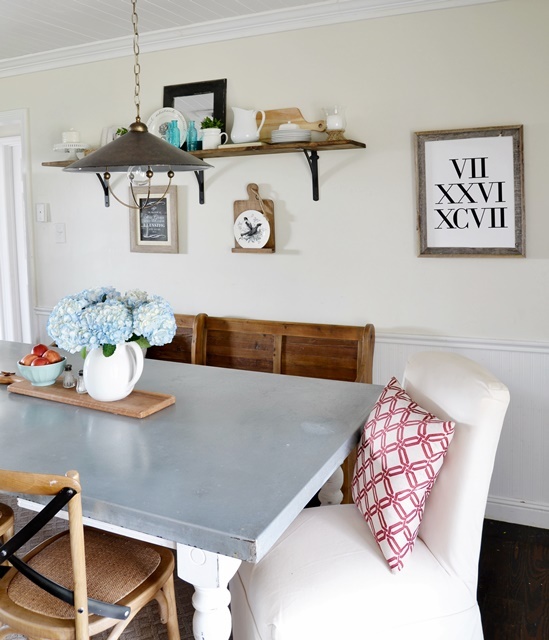 I just found your blog today via Pinterest and your dining table. I can’t believe the before and after. I am experiencing the same lack of warmth feeling in my dining room. I love how the pieces you added just make me want to linger after breakfast. Now I have inspiration to go toward. Off to keep browsing your awesome blog! Hi Andrea! So glad you found my blog! Thank you for your kind words about my dining area. We have lived here for three years, and my dining area has been so cold and lacking. Now it is warm and just makes me smile every day! :) Come back and see me! Amazing! Every detail is just perfect. The furniture choices are beautiful. You didn’t mention the shelf. Did you make it? 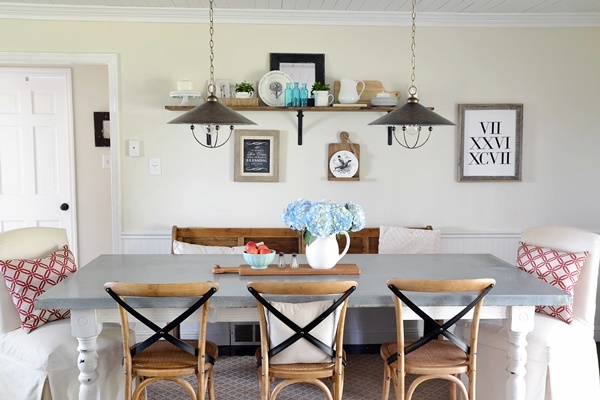 I love this space….makes me want to re do my dining area! Yes, I made the shelf. I will share more about it on my blog soon, but it is basically a 1x10x8 board that I stained dark walnut and supported with brackets from Home Depot. The hanging lights are wonderful. I would love to have them but they are a bit too much money. They look great. This transformation is really proof that hard work pays off! Looks great with the shelf and wall hangings, it really fills up the room and makes it look complete. Hey Trac, What is the significance of 7-26-97? Your dining space is awesome. 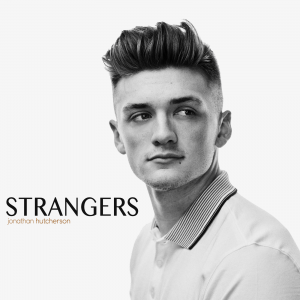 A close friends to mine are changing their a bit, so I would totally recommend your idea.